Denim-on-denim tends to get a bad rap, because when it's done poorly, it can be pretty hideous (anyone remember the JT and Britney head-to-toe denim debacle?). And perhaps you've heard the term "Canadian tuxedo," which is often used derogatorily, but actually has a noble origin: after Bing Crosby was denied entry by a Canadian hotel whilst wearing a matching denim jacket and pants, Levi's made him an actual tuxedo jacket out of denim, which Crosby proudly wore. I think that's pretty sweet, and also proof that denim-on-denim can look classy—if you do it right. Conventional wisdom would have you vary your shades of denim, but I chose to keep things tonal and instead vary my fabrics. 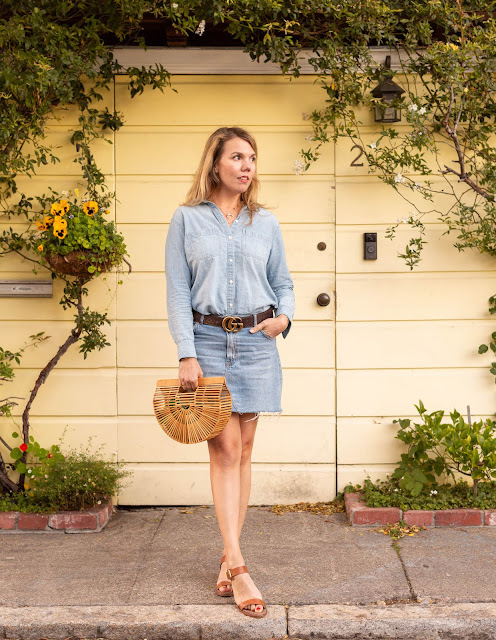 I am also cheating a bit by wearing a chambray shirt and a denim skirt (instead of a denim jacket and jeans), but like I always say, rules were meant to be broken. Anyway, this is one of my favorite Madewell shirts; it's made out of chambray, which is a lighter, non-twill version of denim. The lighter shade is perfect for warmer weather, and this shirt is even better with the sleeves rolled (I kept mine down because I was literally freezing to death during this shoot). For reference, I'm in a size small—this shirt runs big. In cooler weather, I'd totally pair a chambray shirt with jeans, but since it's summer, a skirt was in order. 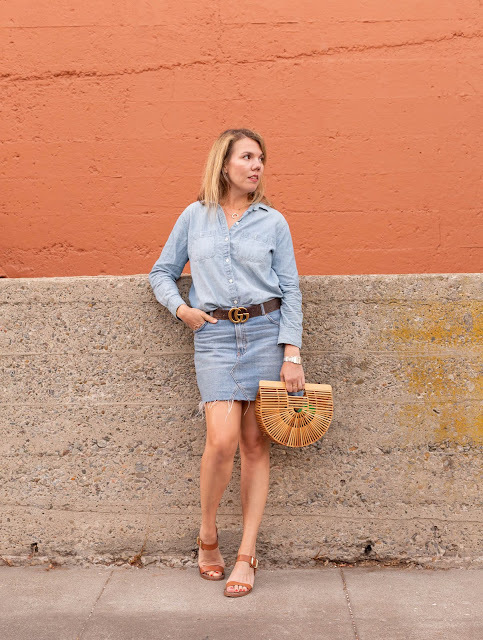 Plus, this outfit is all about a more feminine take on the Canadian tuxedo. 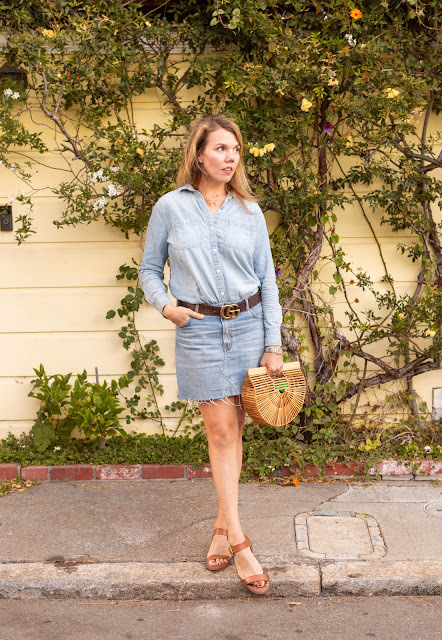 Wearing similar shades of denim is actually more slimming; if I had worn a darker denim skirt, that would have cut me in half and made my upper half look heaver. Monochromatic is more streamlined! This skirt is by Topshop (you last saw it here), and as with all Topshop styles, I recommend going up a size. I did add a belt to define my waist, however, and as a nod to cowboys (i.e. the originators of the Canadian tuxedo), this one has a huge buckle. P.S. you might hear a lot of bloggers saying they're "over" their Gucci belt, but for the record, I still love mine. 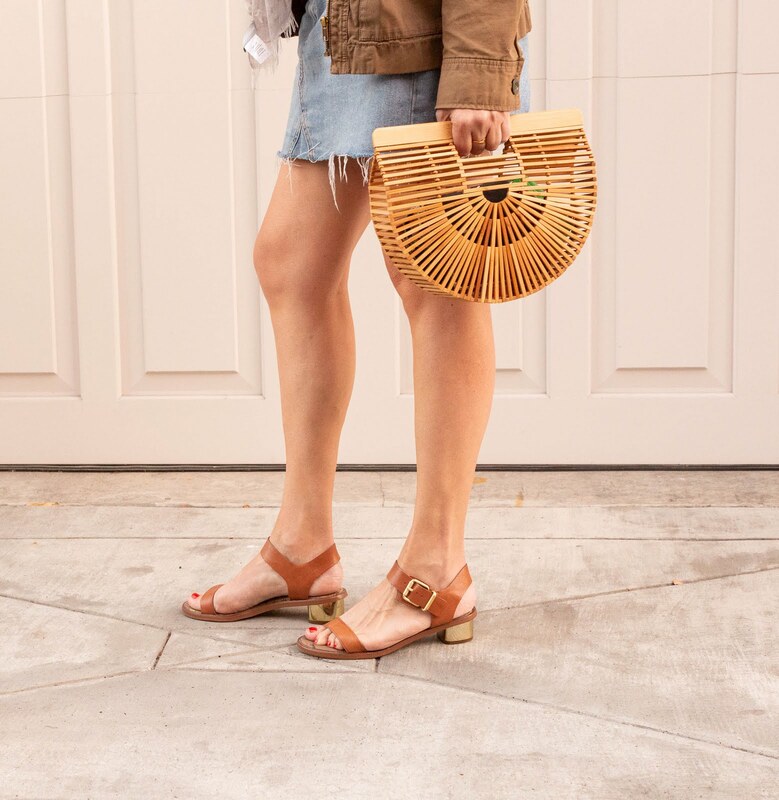 Speaking of things I still love but other bloggers may be over: this Cult Gaia Ark bag (last seen here), which adds a nice bit of texture to this look. I still think the design is just so cool, and I always get several compliments whenever I carry it. 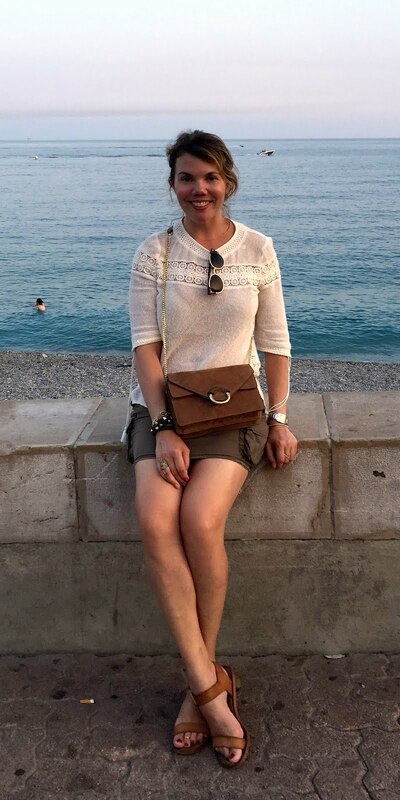 It's perfect for summer, as are my sandals (which you last saw in this post). I am on my second pair of this style—I wore my original ones so much, the strap broke (and my shoe guy was unable to repair them). They are incredibly comfortable, thanks to the cork footbed, and the heel gives you just enough height. Fun story—I was on Google Maps looking for locations in which to shoot and discovered this adorable block-long street...which is four blocks away from my house, where I've lived for four years. Hello, Captain Oblivious! I like the belt you wore to break up the denim on denim and brown accessories! I love this look and think you've styled it perfectly!! Great post, Cheryl! I loved the explanation of the "Canadian Tuxedo." Great story! Cute outfit, too. I love denim on denim. Great look babe! It's unfortunate denim on denim has a less-than-favorable reputation. It's such a streamlined look. I like the break up of texture with your handbag. I love how you styled this denim on denim look, and these sandals are a summer favorite of mine. They are so comfy! Love this whole outfit and those sandals are gorgeous! Thanks for joining my weekly linkup. Love this! Posted a similar one on my feed recently! Love this cool, easy going look on you Cheryl! I finally bought a jean skirt this year and had been looking for a long time. I wear it often. Looks great with the neutral acceossories. Love this look, Cheryl. You styled double denim beautifully :) Thanks for sharing at Creative Mondays. This is such a cute take on double denim! 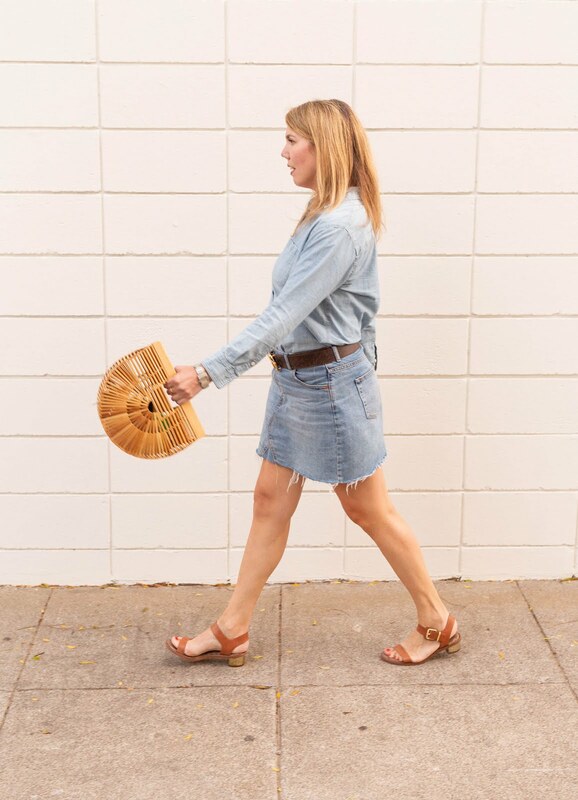 I love the denim skirt and chambray mix. 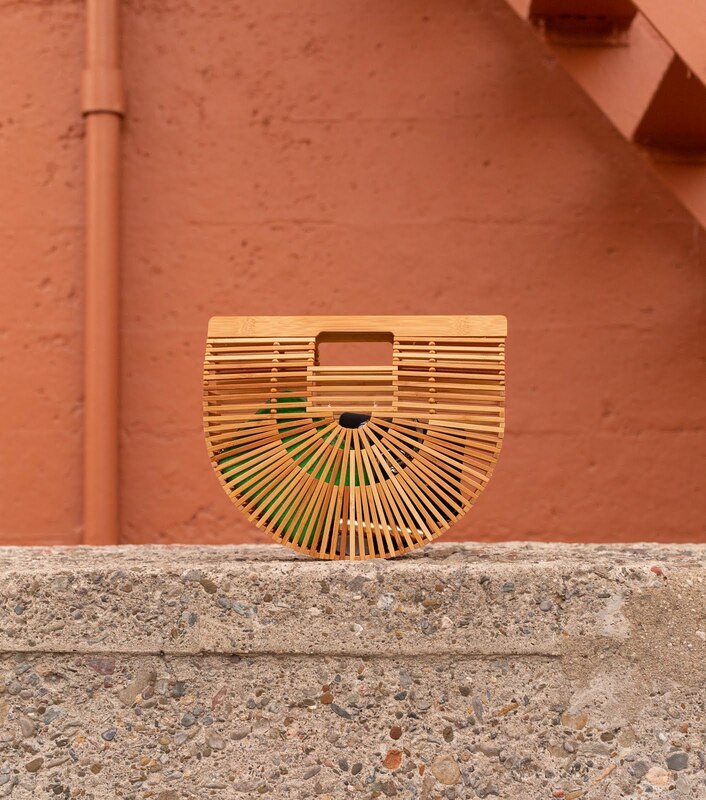 It looks so good with your cute bag and sandals. I enjoyed reading how the Canadian Tuxedo originated, so thanks for sharing! I love this double denim outfit! The neutral accessories look great with it! Thanks for linking up! Ohh god seriously you looks so beautiful dear love to see your post.